The Edge-of-the-Field of Clinical Ethics Now, After 30 Years: Does Research Ethics Show Us the Way? Edmund D. Howe, The Journal of Clinical Ethics 30, no. 1 (Spring 2019): 3-16. There have been many advances in clinical ethics over the last three decades, since The Journal of Clinical Ethics first came about. This issue of JCE notes some of them. Fortuitously for this goal, new requirements for doing research just have been published, and the leading United States research ethics meeting has just concluded. The conference offered edge-of-the-field presentations in research ethics, and indicates where we should go beyond this edge: what we still have to do. In this article I build upon foundations to explore what they imply for what we should do now in our clinics. 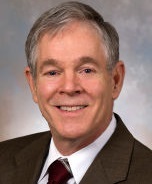 Mark Siegler, Guest Editor, The Journal of Clinical Ethics 30, no. 1 (Spring 2019): 17-26. In 1972, I created the new field of clinical medical ethics (CME) in the Department of Medicine at the University of Chicago. In my view, CME is an intrinsic part of medicine and is not a branch of bioethics or philosophical ethics or legal ethics. The relationship of patients with medically trained and licensed clinicians is at the very heart of CME. CME must be practiced and applied not by nonclinical bioethicists, but rather by licensed clinicians in their routine, daily encounters with inpatients and outpatients. CME addresses many clinical issues such as truth-telling, informed consent, confidentiality, surrogate decision making, and end-of-life care, while also encouraging personal, humane, and compassionate interactions between experienced clinicians and patients. The goals of CME are to improve patient care and outcomes by helping physicians and other health professionals identify and respond to clinical-ethical challenges that arise in the ordinary care of patients. As Edmund Pellegrino, Peter A. Singer, and I wrote in the first issue of The Journal of Clinical Ethics, 30 years ago: “The central goal of CME is to improve the quality of patient care by identifying, analyzing, and contributing to the resolution of ethical problems that arise in the routine practice of clinical medicine.”1 Similar to cardiology and oncology consultations, ethics consultations are a small component of a much larger field, and the process of consultations is certainly not at the core of cardiology or oncology or CME. In this article, I intend to discuss the origins of the field of CME, its goals and methods, the relationship between the broad field of CME and the much narrower practice of ethics consultation, the contributions of the MacLean Center at the University of Chicago in developing the field of CME, and, finally, how CME has improved the practice of medicine in the United States. Nonsubscribers--click here to access this article. Joseph J. Fins, The Journal of Clinical Ethics 30, no. 1 (Spring 2019): 27-34. While neuroethics is generally thought to be a modern addition to the broader field of bioethics, this subdiscipline has existed in clinical practice throughout the course of the 20th century. In this essay, Fins describes an older tradition of clinical neuroethics that featured such physician-humanists as Sir William Osler, Wilder Penfield, and Fred Plum, whose work and legacy exploring disorders of consciousness is highlighted. Their normative work was clinically grounded and focused on the needs of patients, in contrast to modern neuroethics, which is more speculative and distant from the lived reality of the clinic. Using recent developments in the diagnosis and treatment of disorders of consciousness, and the history of the vegetative and minimally conscious states, Fins asks why modern neuroethics has taken this turn and what can be done to restore clinical neuroethics to a more proportionate place in the field. 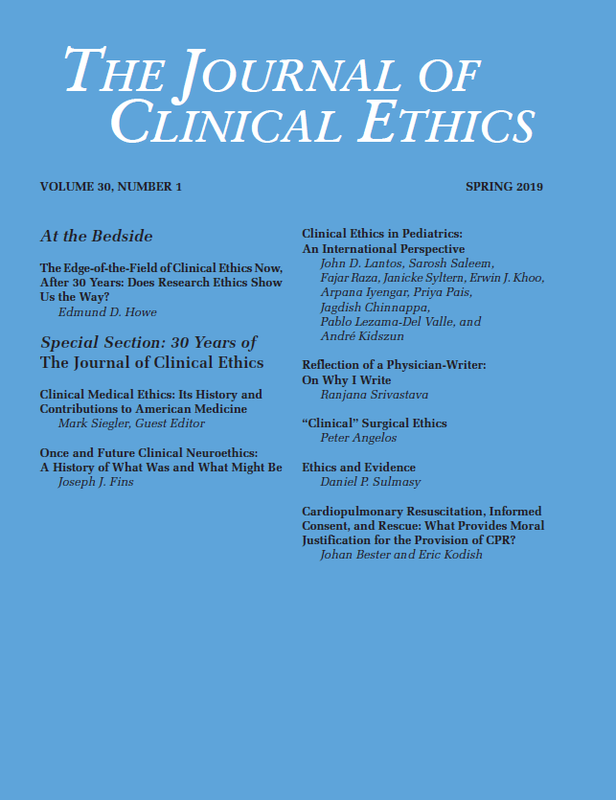 John D. Lantos, Sarosh Saleem, Fajar Raza, Janicke Syltern, Erwin J. Khoo, Arpana Iyengar, Priya Pais, Jagdish Chinnappa, Pablo Lezama-Del Valle, and André Kidszun, The Journal of Clinical Ethics 30, no. 1 (Spring 2019): 35-45. In this article, we first review the development of clinical ethics in pediatrics in the United States. We report that, over the last 40 years, most children’s hospitals have ethics committees but that those committees are rarely consulted. We speculate that the reasons for the paucity of ethics consults might be because ethical dilemmas are aired in other venues. The role of the ethics consultant, then, might be to shape the institutional climate and create safe spaces for the discussion of difficult and sometimes contentious issues. Finally, we report how pediatric clinical ethics has evolved differently in a number of other countries around the world. Ranjana Srivastava, The Journal of Clinical Ethics 30, no. 1 (Spring 2019): 46-48. In the course of their increasingly busy lives, physicians encounter many emotions that move and challenge them. Writing is a valuable tool for self-expression and making sense of the world. Physicians are often concerned about patients’ confidentiality and not upsetting their colleagues, but writing can be one of the best ways of sustaining a healthy and meaningful career and effecting change. Peter Angelos, The Journal of Clinical Ethics 30, no. 1 (Spring 2019): 49-55. The practice of surgery requires consideration of a number of specific aspects of clinical medical ethics that are different from those most influential in other areas of medical care. The nature of surgical care alters the sense of responsibility that surgeons feel for their actions and also alters the relationship between surgeons and patients. Because surgical care requires patients to place such great trust in their surgeons, surgical informed consent must emphasize the importance of that trust. Surgeons must use innovative means to solve individual patient problems even if the result is a novel operation. Surgical procedures may be altered due to the unexpected findings in the operating room and therefore surgeons must have considered how to respond in such situations. The future of surgical practice will inevitably lead to increasing ethical concerns in maintaining the ethical dimension of surgery, in allowing autonomy for trainees while maintaining patients’ safety, and in balancing surgical risks of prophylactic surgery with the genetic predisposition to develop cancer. Daniel P. Sulmasy, The Journal of Clinical Ethics 30, no. 1 (Spring 2019): 56-66. Towards the end of the last century, bioethics underwent an “empirical turn,” characterized by an increasing number of empirical studies about issues of bioethical concern. Taking a cue from the evidence-based medicine movement, some heralded this as a turn toward evidence-based ethics. However, it has never been clear what this means, and the strategies and goals of evidence-based ethics remain ambiguous. In this article, the author explores what the potential aims of this movement might be, ultimately arguing that, while the development of good empirical research can and should aid in ethical deliberation, one ought to avoid assuming or suggesting that empirical studies themselves determine normative prescriptions and proscriptions. The limits of the use of empirical studies in bioethics are explored in detail, and 10 potential ways that such studies can soundly contribute to bioethics are described. Good ethics depends upon sound facts, but ethics cannot be based on evidence alone. Cardiopulmonary Resuscitation, Informed Consent, and Rescue: What Provides Moral Justification for the Provision of CPR? Johan Bester and Eric Kodish, The Journal of Clinical Ethics 30, no. 1 (Spring 2019): 67-73. Questions related to end-of-life decision making are common in clinical ethics and may be exceedingly difficult. Chief among these are the provision of cardiopulmonary resuscitation (CPR) and do-not-resuscitate orders (DNRs). To better address such questions, clarity is needed on the values of medical ethics that underlie CPR and the relevant moral framework for making treatment decisions. An informed consent model is insufficient to provide justification for CPR. Instead, ethical justification for CPR rests on the rule of rescue and on substituted interest judgments. Patients’ known wishes and values are relevant, particularly in protecting them from unwanted CPR. Clinicians should rescue patients with the means at their disposal, as a prima facie moral imperative, unless there are compelling reasons to refrain. We present a moral framework for making decisions regarding CPR and DNR.